These are my favorite new pillows. They are fast and unbelievably easy to make…and I hope you love them as much as I do. I did my best to simplify the instructions/pattern so they are beginner friendly, and super fun to make. If you’ve never worked with a template or curves, and your nervous about it…these pillows are a perfect place to start. The only problem with them is that you can’t make just one…trust me …I tried. *For best results, print the templates directly from google docs (click file on the left and print). If you are using explorer or firefox….make sure you hit “fit to printable area”, or “print actual size” in the printer preferences. ** Please do not re-post the link to these templates on your own website! Thank you! Large fabric scraps for the top wedges, a 5″ x width of fabric strip for the middle (plus a little extra for the large size), a fat quarter for the back, a bag of poly-fill stuffing, and a button and thread for the center. 1. Cut out the template for the size pillow that you are making. Using the template cut out 12 wedges. 2. Arrange the wedges how you like them. Sew the wedges into pairs, right sides together. Sew from the tip to the end. Use a 1/4″ seam allowance while constructing the pillow top. 3. Press and arrange the pairs. Sew the pairs into two halves. 4. Pin the edges and center seams of the halves together. Sew the halves together, slightly pulling or easing the fabric as necessary to get the edges and center to match. Don’t worry if your center seams don’t match perfectly…that’s what the button is for. Press well. 5. 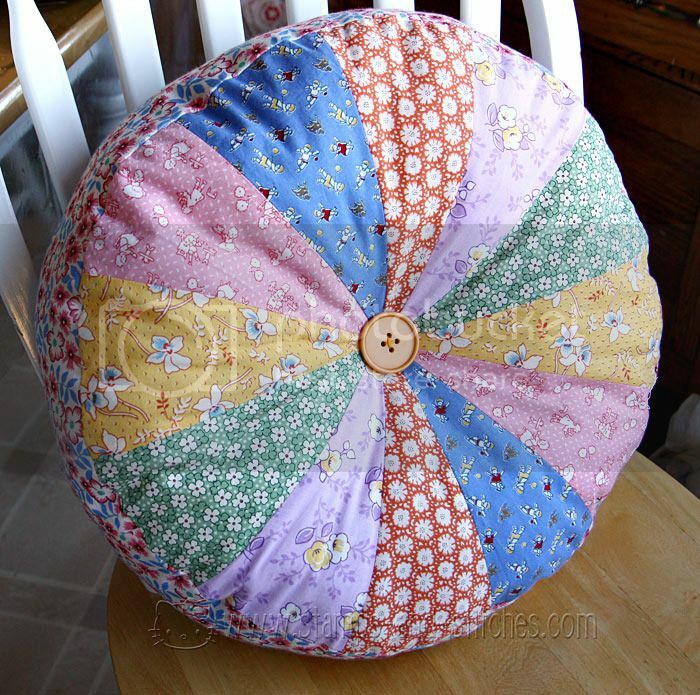 Make the pillow back by folding the backing fat quarter, and the circle top in half. Line up the folds, trace, and cut out the back. Sew the ends of the strip right sides together using a 1/2″ seam allowance and press. You’ll use a 1/2″ seam allowance from here on out. 7. Pin one edge of the strip to the edges of the pillow top. Start anywhere and work your way around, easing or slightly stretching as necessary. If you have too much excess, pin all the way around except for the last 6” or so and pinch the extra together and sew it together. If you don’t have enough strip and you can’t slightly stretch it larger…you can either cut and sew another small strip on, or pin the strip 1/8″ or so in from the pillow top edge. Remember that you can’t use too many pins! 8. Sew along the edge using a 1/2″ seam allowance. 9. Now pin the other edge of the middle strip to the backing, right sides together. Do it the same way you did the front. 10. Again, sew along the edge using a 1/2″ seam allowance…but this time leave a 4″ hole for turning and stuffing. 11. Turn the pillow right side out and stuff with your poly-fill. I like my pillow to look full but still be really cushy…that way when you add the button it sinks right in. 12. Sew up the hole either by hand or machine. 13. Get your button, needle and thread ready. If you want to make a fabric covered button like I did…you can buy kits at any fabric/craft store….they are super simple and take about 10 seconds. I recommend using thick thread like embroidery thread to add the button….but I didn’t have any for the tutorial so just ignore the thread I’m using in the photos. Knot the end of your thread and put the needle through the center back of your pillow and push it to the front center. Loop the thread/needle through your button a few times and put the needle back through the front to the back. Pull the thread until the button is depressed in the front enough for your liking, and knot the thread in the back of the pillow. You can cover the back knot with another button…or just leave it. And there you go. Aren’t they fun???!!!! Now you can make more in no time! Your tutorial was excellent. I made one of the larger pillows. Turned out cute. Thanks! Hi there, just wondering how you made the template? Im finding it difficult to create my own since its a curved piece? not sure how to go about doing it. Its for a class project. Any help would be very appreciated Thank you. thank…THANK YOU…for taking the time to take pics, etc for this tute…It is REALLY cute… I sew wanna make one!! Thankyou very much for showing us how to make these delightful cushions it is very kind of you ,well done they are gorgous. Thanks for the tutorial Allison and relax and catch up! Thank you for that great tutorial :). Can't wait to make some of these – they are absolutely adorable! These are fabulous… adding them to my future projects list right now. Thanks for sharing your creation with us, and showing how to make for ourselves. I lurve these they are awesome I also saw the words quick and easy in there so I am really looking forward to making loads of them! Thank you! You can bet I will be making oodles of these fun pillows! I will blog them, and link you up! very pretty,thank you for the tutorial. Oh Thank you for being my first blog to follow and my favorite to this day! Thank you for helping the beginners. Thank you for being you. I love the pillows.. thank you SO much for the pattern and tutorial! Love the pillows, I want to get started tomorrow! Thank You. I seem to have a bit of a pillow obsession lately and I adore these. I'm making one today! Es genial, me gusta muchisimo. They are so adorable! I never thought I would you that word to describe a pillow! Great tutorial! Beautiful pillows! Thank you for sharing! Thank you! I am making one right now! I am finding that if you cut a layer cake square in half, you can get two large template wedges out of one half, and then use the other half (5 x 10 inches) to piece together to make the edge strip. So out of 6 layer cake squares and then a piece of fabric for the back, you can make a large pillow, or a large AND a small pillow if you use a different fabric for the sides! These are too adorable! THANK YOU for the great tutorial! Can't wait to make some! It´s so cute. Thanks for the tutorial. Well Done~ Enjoy your break. The blogging has been super…but me time is absolutely necessary for everyone. Un fuerte abrazo desde Venezuela!!!! Awesome pillow, Allison. Can't wait to try this. Love it! Oh gosh! Another great thing to add to my list of do's. Reminds me of my mom and gram's couch. I have so many irons in the fire, this one will have to wait till my sewing is caught up. Really cute! Thank you for sharing! What cute pillows! I'm printing out the templates right now and going to make some this week. Thank you for always sharing your creative ideas with us. You are just the sweetest thing and I love everything you offer up on this blog! Take the time -well deserved. thank you for always sharing so many wonderful projects! Thanks for the great tutorial, and have a wonderful time catching up with life! And a big fat thank you to you, Allison! What a great tutorial…easy with pictures…my kind!! Your blog is charming and I love visiting it…such eye candy! Have a great "time-off"…looking forward to your return. love love love these pillows! thanks so much for the template and the tutorial. If I weren't going to do a sew day with my friend (we're doing a quilt along of the Single Girl Quilt), I'd be making this pillow! Those are REALLY cute! I may just have to give those a try, even though I haven't ever attempted anything like that! Thank you for sharing!! Thank You so much Allison! They really are very cute and I can't wait to make one! I LOVE these! Thanks so much for sharing this darling project with us! Wow, I love these! Thanks so much for sharing the tutorial with us! Wow!! Lovley! and thanks so much! Wow! Simply fantastic! I'll make it!!! Both pillows are wonderful! Thank you. Hope you have some wonderful peaceful time to get caught up on non-blog stuff. These are beautiful. I cannot wait to make some. Thank you for always inspring me and so many of us. You are amazing. I think we should be thanking you! Very pretty!! Love it and thank you for sharing!!! You inspire me!! in MANY MANY ways, I want to publish my own patterns-write more tutorials for my blog….so much!! Don't know how you do it!!??? you are the best…. thank you! Enjoy your blogging break and will look forward to you coming back. Thanks again!! Love you, Allison! I've been casting around trying to find this pattern ever since I saw your pillow like this a few months ago. I can't wait to start cranking them out. I hope you have a relaxing and enjoyable break. bless your sweet heart for being so generous. I clicked on a link to your blog today from littlebiggirlstudio and the page loaded up with those awesome pillows! I love them! the fabric you used is just perfect. You made them look super easy in your tutorial. I have never done curves before, but I just may give it a try. Thanks for the tutorial! I cannot wait to make one! Thanks! It's very cute! I want try! Next time I'll show it! You're such a fabulous explainer. You make everything seem so easy and totally doable. I love it! Thanks so much, I'll be linking. Glad this showed up in my Google Reader this morning! Mondays are my day off and I was looking for a good project – it went together great! My new Sprocket Pillow is sitting on ours bed! Amei o tutorial. Muito bom! Vou tentar fazer! Felicidades e sucesso! Deus abençoe a todos! These are ADORABLE!!! Thanks for the inspiration! Thanks so much for the fantastic tutorial! I love these pillows and I love you! I subscribe to a bazillion blogs but I always have to read yours. You have brilliant skills and ideas but also I love that you don't update your blog every day. As a fellow blogger I honestly can't believe how other bloggers don't get overwhelmed with everything and still post awesome things every day. Good luck with all your tasks at hand! Loved this tutorial!!!!! It went together very smoothly and quickly! You are a great inspiration, thank you! I love love love these pillows! Can't wait to try them. Working on the Raw Edge Circle Quilt now and it is so super cute. Thanks for all the fabulous ideas! Oh, this is perfect! I have lots of fabric scraps and will make some of these for Christmas gifts. I like to start early. :) Thank you! Thank you very much Allison, is a great tutorial and enjoyable to do. And i've already had to sew them back on 3 times! Mmm. I have just finished a cathedral patchwork cushion. I know this is my next project. I love it. I lovelovelove these pillows!! Thank you *so* much for the tutorial…these are now on my to-do list. These are gorgeous! I'm doing my children's room in those exact colors- some of my favorites. Thanks so much for the tutorial! super cute! Thanks for sharing! LOVE these! Thanks for the tutorial! I'm new to sewing and have been looking for my next project…one for a beginner. I've found it! THANKS! Love these pillows! Thanks for the tutorial, i've been wanting to spice up my pillow selection! You make it look so easy! I love the fabric selections you use! Thank you for sharing. These pillows are really cute and I do plan on making some. I enjoy your blog! These pillows are SEW cute I can barely stand it! I'm getting my Bernina next weekend! Can't WAIT to learn to SEW! Thank you for all that you share! I tweeted about this tutorial! I am going to dig through my scraps this afternoon and make me a few dozen! I love these! Thank you! Very cute! I will keep this wonderful tutorial in mind! Lovely pillows! Thanks for just being there sharing your life and projects with us. It's always a nice surprise to visit you here! Oh my gosh, these are cute pillows. Thanks so much for the great tutorial on how to make them. Thank you for the tutorial, it was very simple and the pillow turned out great! Thnak you so much for the tutorial. I have made four so far and I have modified the pattern to make a 3' floor pillow for my daughter. They all turned out great. LOVE these pillows…they are my next project. Linked to your blog. Love this! I featured it today on Today's Top 20! Obrigada por compartilhar! Adoro almofadas redondas! I love your site and these pillows! I had to make some once I read your tutorial. Check out my log to see a picture of it! Clever! Nice way to use up scraps! I have made floor cushion earlier but never thought replacing it with bits of fabric or was i was too lazy to actually sit down and join pieces. These are so cute, they have been promptly added somewhere near the top of my crafty to do list! I found these over at agaagg… I hope they're half as easy as you make them look, because if I can do it properly these would be perfect for using up a bunch of fabric scraps I have collected over the years! Thank you so much for sharing! These look amazing! Your tutorial is great, will be trying to follow along and make one or two! Stopping thanks to agaagg! This is gonna be my next project for my little girls room. Im some what new to sewing and this looks like a great tutorial! Thanks for posting! Now following! featured this on my blog today! I really love these pillows! In fact, I scheduled a mini feature of it at Extreme Personal Measures. Ooooohhh I'm in love:-) <3 pure love at first sight!!! Thank you so much for sharing this tutorial!!!!!!!!!!!!!!!! Definitely on my to do list on my blog @http://sewhappiness.blogspot.com. LOVE these pillows! So cute! Thanks for the tute on how to make them! Stopping by from AGAAGG!!! I saw you on a girl and a glue gun… these are the cutest pillows!! Thanks so much for sharing. I'm going to make some today! Oh my word, LOVE this! I might have to attempt this (attempt being the key word!) Thank you so much for sharing! Love these pillows! Can't wait to make one, thank you so much for creating and sharing this tutorial! These are great! Thanks for sharing. I can't wait to get started on mine. I will be featuring you on our blog ziggycrafts! Absolutely LOVE these! I think I might need to make two for the boys for Easter. Great way to use up some of those favorite fabrics. W O N D E R F U L!!!!!!!!!!!!!!!! Thank you very very much for this tutorial!! I love this! I am going to make some with the scraps leftover from the quilt I made (using your pattern) for my daughters bed!!! THank you!!! Thank you for sharing, it lools really easy and it's a cute pillow. I'm going to make one this Easter holidays! Wow, thanks so much for this tutorial, these are absolutely gorgeous! I just made one for my son and he loves it. First he stood on it, then threw it, and finally hugged it. Toddler approved! I'm definitely going to make more of these! Thanks! Awesome, and thankyou, can't wait to make me a few. Thank you for putting that tutorial up! They are so amazing and I can't wait to make a few! Just wanted to say thank you, Allison. I made one of these for my sister last month (finally just got around to blogging it) and am so jealous. I can't wait to make one for myself. Thanks for your generosity! I love these. Can't wait to try making some! Danke für die schönen Kissen und Danke für die tolle Anleitung. ryan sent me and he said to tell you that your pillow is yummy but his is yummier, LOL! just teasing. having a pillow give-a-way?? here i am, with my arms outstretched! Ryan sent me! !…your pillows are stuffed more than his…but they are all wonderful. Just finishing up a quilt for my great-nephew and will make one out of the scraps (John Deere fabrics) should be a fun pillow for him. Will be following your blog now that I know about it. What a kewl idea!!! love dresden plates anyway so why not make a pillow.. thanks for the tutorial,, by the way Ryan sent me..
Those are great! I esp. love your fabric choice. I made something similiar from my scraps last weekend. See pics on my blog, I linked to your tutorial for anyone who might be interested. I hope that's ok. I love all of your designs btw. you truly have a hand for chosing the fabric. I just saw these on "positively splendid" – they just got added to my pinterest 'crafts I MUST make' board. Thanks for the fun tutorial! Many thanks for the pattern and tute Allison! This looks like lots of fun. You are even more generous than Ryan said you would be!! They look wonderful. Thanks for such lovely clear instructions. what a great tutorial. Thanks so much and now I will take a trip to your blog and other postings. I just wanted to say thanks for the awesome tute. I have just made my first sprocket pillow and it turned out fabulously – thanks to your easy instructions and printable pattern. I will be writing a blog post with a link to you. I just love this cushion and I had to whip up a couple. They look sensational. Your tut is great. & sorry im not that neat. I just threw it together.. You can link off to my blog and see how mine turned out. Thanks again from down under. Hi there, these pillows are gorgeous. Thank you so much for the tutorial. As a way of a thank you, if you are still in need of fabric for your humanitarian quilts then please let me know as I have a large fabric stash and I would happily send you some. Oh gosh.. I just made a sprocket pillow and I have to say I am IN LOVE with the pattern. I made one for my niece's birthday and it was so quick! I blogged about my pillow here if you're interested. Thanks again for the lovely pattern. Thank you very much for this great tutorial! I'm Dutch but and even for me it was very easy to understand!! So nice to see a pillow named after me. If I ever get any spare time from crime blogging to get back to sewing, I might try making one of these. You did an excellent job of presenting the steps on how to make this pillow. So cute, so easy… I love love love them. Had to make them. I made quilts for my kids (6) and now am making matching sprockets. http://robandjanbishop.blogspot.com/2011/08/using-up-scraps.html Thanks for the wonderful tutorial. wow, such an awesome tutorial and sweet pillows! Thanks for sharing! Hello. I landed here through a friend of mine and I was so inspired by these pillows that I HAD to make them. The tutorial was so easy (very well explained)to follow and I am happy with the outcome. I make quilts myself (well, used to.. now I have moved onto a different "addiction") Your quilts are all so beautiful and I love coming here to look at all the pretty fabrics and what you make with them. Thank you for sharing and thank you for inspiration! I featured your blog on mine. Love this tutorial! Thank you for all of the inspiration. Your blog is one of my favorites! Your tutorial inspired me to make "pincushion" versions, which make me smile every time I use them. So, of course I had to feature your tutorial on my blog, SEW that! I just made one, and am by no means experienced with sewing. It was a lot of fun…and I LOVE the outcome!!!!!!!! Thank you for sharing! Thank you for this lovely, lovely tutorial. I love this pillow. Many creetings from Finland ! What a great look.How pretty. Thank you for the wonderful pattern and tutorial. I am a beginner, and I am constantly feeling overwhelming by blogs and tutorials. Yours was easy to follow — and it was my first successful sewing project! Thanks again. I saw your Sprocket Pillow made up in Halloween Fabric at LolaPink fabrics today. I have not sewed in years, but, now I am inspired. I cannot wait to give your pattern a try. Thank you so much for the pattern and tutorial! So awesome! Vou tentar fazer, espero conseguir. I'll try to do, I hope to achieve. I'm a fairly new subscriber to your blog. I can't wait to make one or two of these pillows. They're just beautiful! I have linked to you in my post. This is SOOOO cute! This is a perfect Christmas gift for my sister in laws! Thanks so much! I think these are great! I'm very new to quilting, sewing and of course pillows. I have made pillows with the embroidery blocks but never pieced pillow's. You're tutorial makes it very easy to follow!!!! Very Pretty!! Great tutorial!! I sew, so your instructions are easy to follow!! Thanks! I had just finished a baby room collection with a quilt and bunting and now I have a lovely pillow in matching fabric! Wonderful stuff, thank you for sharing. so cute! As always, you have the best taste! Thanks for posting the tutorial and pattern, this is on my to do list for my daughter's room, I think these will look so cute on her bed! awesome! I can't wait to make one! Many thanks for this wonderful tutorial. These are terrific, thank you for the great tutorial! Thank you for the wonderful tutorial! I made one for my girls' room and it was so fun to make! 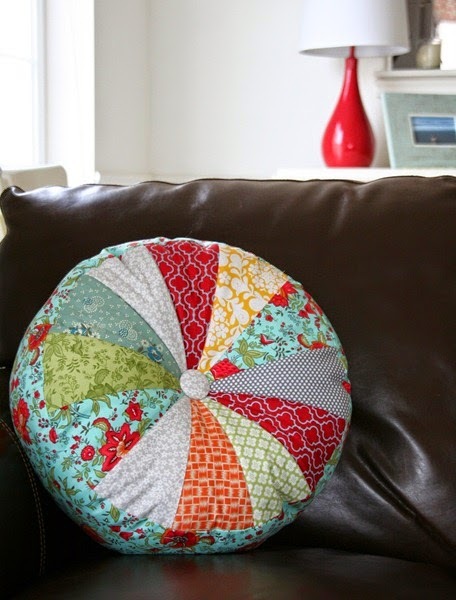 Love this round pillow! Thanks for the tutorial…Def going to make some. Love your blog!! Muito obrigada por disponibilizar o tutorial, e ainda por cima, muito claro e objetivo. Wow! Brilliant tutorial. I have been looking at heaps of other tutorials similar to this and they are all a bit complicated. Thank you for the simplified instructions. I would like to make a few of these but much bigger, to use as floor cushions. I am a newbie sewer and have know clue how to enlarge this pattern to make it bigger. Any help or suggestions appreciated! Thank you for posting this tutorial. I love the pattern. I have made two thus far. My points aren't meeting up exactly but with a button in the middle or an appliqued heart like I did the last one, a person would never know. I just sent the link to a friend who loved it and wants to makes these for charity. God bless you. I enjoy your sight. Hi, I'm Angela from Italy, your tutorial is great! It was so fun to make it ! Your pillows and tutorial are terrific! Thanks for sharing! Thanks for lovely tutorial and sharing your wonderful ideas. I love this Accent Pillows its nice and easy way. love these pillows…i'm moving into a new house so i'm excited to make some for my bed! Thanks for another great tute .I will be making a few of these cute pillows. Fun and easy …love it. Even have a few newbies to sewing trying some tutes. Wow, I have seen a few of these on blogs and loved them, thanks so much for the easy to follow tutorial I now have another item on my must make list. My friend has pillows almost IDENTICAL to this, but she paid a ton of money for them at Urban Outfitters! Good on you! I'm just as excited about this pillow as I was when I first saw the Pom Pom pillow on another blog and ran out and made me one of my own! I love your pillows – they're gorgeous! I've got this linked to my pillows post as well today, for inspiration! Just loved them! Thank you for the turorial! Thanks for a great tutorial! I made one last night for a swap (I have to run out for a covered button.) FYI, I quilted the top, only stitching out 1/4" from the the seams on all sides, and I really like the way that looks and feels (I always put a layer of batting close to the outside fabric so it's nice and smooth with stuffing. :) Thanks again! i see that you used a machine, how long did it take for you to finish a pillow? and would it be possible to use silk or satin like fabric to create this pillow? Sou fã de seu site, e agradeço pelos moldes e tutorial, as almofadas estão lindas! !Parabéns pelo trabalho!! Tomei a liberdade de coloca-las em meu blog com seu link…voc~e me dá autorização? A big thank you from Holland! So sweet of you, sharing this on your lovely blog! What beautiful pillows! Love the fabric you used. Thank you for the tutorial. I made two today! I can't wait to make this pillow!! So cute! I really love these pillows! Thank you for sharing this tutorial! I just love this pillow. Thanks for the tutorial. I have just pinned it. I made two sprocket pillows since I've discovered your amazing tutorial and both turned out beautifully! Thank you for sharing this. loVE THESE!! I remember my grandmother having some when I was a kid!! These pillows are great! I can't wait to make them — thanks for the instructions. this tute is really lovely and the results are gr8 even to me, that i'm just a beginner. quen you put on the butto, and u pass the thread from the top to the bottom, it' is very useful to pass another small transparent or matching button, to prevent the thread to break the fabric because of the pressure. I really like this colorful pillow.I like its shape very much! Thank you. These look really pretty & I will try them. How awesome, just back to sewing after quite some time, so the middle is not looking so great, but with a button I'm sure it will be fine. practised on really old scraps so looking forward to making another with prettier material. managed to do it over two days which is pretty good for me! thanks for the inspiration. I love the pillow. I am working on some similar I have a pattern for but I like your pattern better. Patchwork pillows are so pretty. Love your choice of colors. Thanks so much for posting the tutorial. Love this pillow! I must try this one. But first I have to find lovely fabrics. Thank you for the sharing idea.I just bumped onto this pillow at the mall and just thought of trying it. This tutorial was by far the best and so easy.your pillows look amazing. I just had to make these the minute i saw the tutorial. I posted the pictures of my pillow on my blog. Heres the link http://deliciousanddiy.wordpress.com/2013/12/29/diy-sprocket-pillow/. I guess I am coming to the party a little late, but I just had to say how absolutely lovely the pillows are! I am definety going to make these! I just made the larger version of this pillow as my first true sewing project! It turned out really well, and I intend on making a set to serve as decor. Thank you very much for this free pattern! I wish there was a way to share a picture of it with you. Allison, these pillows are great! Thank you for the wonderful tutorial! Our followers love your book so i'm happy to show them more of your great works! Thank you! A few years after you posted this tutorial and it's still being made and loved! I'm not a fan of sewing circles – they scare me! – but I made the smaller version of this pillow tonight and, you're right, you can't make just one! I'm going to start another one tomorrow! These are gorgeous cushions,I'm in the middle of making a black and white themed fabric one right this minute,can't wait till it's finished. WOW this blog its wonderful! thank you for sharing such wonderful projects! I was so inspired by these "sprocket"(sp" pillows, I made one the 14" one this afternoon. I love it and I was surprised that it wasn't hard, going to gift it to a granddaughter and going to make her brother (grandson) one, also. Thank you for showing such detailed instructions. Love these!!! Can they be washed? Pillows at my house need baths every now and then…. I just made one of these adorable pillows and it turned out so cute. Thank you for an excellent tutorial. I’ll be making them again for all the grand daughters. Hi, thank you for such an excellent tutorial! I made 2 pillows, and i am planning of doing some more! I found your sprocket pillows on Pinterest. Thank you so much for this wonderful tutorial. I made two pillows and in the process of making more. I’ve given them away and really need to think about making one for myself! I would like to post pictures on my blog and of course would link back to you for the tutorial because you’ve done such a marvelous job at this. I saw the pictures of the new baby. Congratulations. Great tutorial – thanks for sharing it. I made one this evening and am really pleased with it. I know it’s been a really long time since you posted this but I’m new to sewing and just found your tutorial. I wanted to say a great big thank you for such wonderful directions. They were super easy to follow and my pillow turned out stinkin’ cute! THANK YOU!!! I loved how easy this pattern was to follow. I made the larger one for my great niece’s birthday (she just turned 2) but before I sewed the opening closed, I made a little strap handle out of some of the extra material and attached it where the opening is. Now she can pick up the pillow and drag it around the house and then use it to sit on to watch her favorite cartoons. I love that this can be made with just a few fat quarters, a great project for the beginner sewer! love love love your pillows. I’m going to make some to go with my king size quilt that is almost done, they will be so cute with my quilt. Thank u for the design. Thank you for the great tutorial and template. Super easy to put together BUT I didn’t sew in the side piece, which really looks so much nicer. The next one will have it. I know this post is 6 years old but I wanted to say thank you for the pattern and tutorial. I found it months ago and made 6 of the large pillows out of my grandmothers clothes. She passed in December and I made them for my father and his sisters for Christmas. I just searched again for your tutorial so I could make another pillow for myself. Thank you for sharing. I’m so glad you’ve enjoyed it! I just found you pattern for the sprocket pillow today. I can remember everyone had pillows like this when I was a little girl. Lots of good memories. I want to make my granddaughter one by this pattern. Maybe some day she will look back and have good memories too. Thanks for sharing. how to wash this pillow?